As I finish writing my Codex Judas Congress paper for the forthcoming volume, I have become interested in ancient depictions of the apostles as the Zodiac signs. The substitution of the patriarchs and also the apostles was not uncommon in ancient Judaism and Christianity. In Christianity, the idea was that once baptized, you were no longer ruled by the old Zodiac signs, but you were reborn and had a new fate controlled by the apostles (=church?). The Zodiac was a powerful image, even found in religious buildings like this sixth century synagogue. If you know of any ancient art depicting especially the disciples substituting for the Zodiac signs, please share this in the comments, and I'll try to post this information. 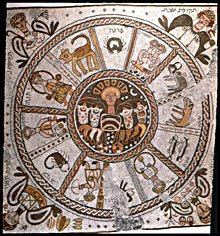 6th c., Zodiac on synagogue floor of Beit Alpha, Beit She'an Valley. You may be interested in the work of Dean Wilson, who is currently examining the relationship between the zodiac, the Lesser Banishing Ritual of the Pentagram, and the Tribes of Israel. It may have some interesting correspondences to what you're studying. I wish I did, since I am more and more convinced that to understand ancient religion in any place, at any stage, and in any group, you have to have an understanding of ancient astrology / astronomy. I would love to hear what you and others cull up. You are absolutely correct. There isn't an ancient tradition that doesn't just assume that you know and buy into ancient astrology. It underlies Jewish, Christian, Gnostic, pagan traditions. It is very hard to get at this material, since so little work has been done on it since almost 100 years ago, with a few exceptions. I recommend reading Kocku von Struckard, and just study the primary texts and try to reap it yourself. I wish we could see the details in this picture. Thanks, Dr. D! It's not art, but Bill Darlison's book "The Gospel and the Zodiac" is an interesting read, mapping ancient astrology to the Gospel of Mark. I'd be interested to hear your take on the book. 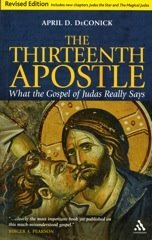 He lays out an interesting hypothesis about the purposes of the Gospel. John Michell and Christine Rhone threw some interesting light on this subject in their book Twelve Tribe Nations and the Science of Enchanting the Landscape (Phanes Press, 1991). They make a very interesting case for the existence of "a former ideal social order in which nations were divided into twelve tribes, each corresponding to one of the twelve signs of the Zodiac." As examples, Michell and Rhone examine the classical amphictyonies of Greece and Asia Minor, the twelve gods of Greece and Rome, the twelve cities of Etruria, the twelve Gallic tribes, the twelve Gods of Odin, the twelve saints of Georgia, and the group of twelve Celtic saints who served as apostles to Ireland. While the book does not provide any ancient images of the twelve apostles of the Bible mapped onto the zodiac, it does provide an image of the pantheon of 12 Roman gods displayed on a stone altar in the image of the zodiac. As a source for the cosmological blueprint of such twelve-tribe kingdoms, Michell and Rhone point to Plato's Laws, and suggest that Ptolemy's Almagest, with its concept of the "harmony of the spheres" may have played an important role in the development of the New Song of the Christian gospel. I am very interested in the depiction of both the twelve Tribes of Israel and of the twelve Apostles presented as the twelve signs of the Zodiac. Bill Darlison's book "The Gospel and the Zodiac" depicts Jesus or Yeshua (meaning Yahweh Saves)both as the Sun and as the the character Jesus in Mark's Gospel who allegorically follows the Sun's celestial journey from Aries to Pisces. Spring and summer is spent in Galilee and winter with its death and resurrection is spent south in Jerusalem. Have you posted any more information about this topic?